The Keeshond, a member of the Spitz family, emerged in Germany and was initially called the German Spitz and also the Wolfsspitz but in 1926 the name was changed to Keeshond in England. The closest relatives of Keeshond are the other German Spitz like Pomeranian. They are very famous as family companions. 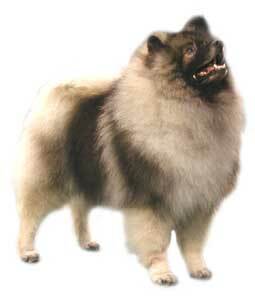 Extremely strong and trustworthy, Keeshond makes an excellent watch dog, show dog and companion. The Keeshond are commonly known as the “Smiling Dutchman” because of their ability to curl their lips which resemble a grin and outgoing personality. Keeshond, brainy and loving, is friendly towards other people and dog and get along with children very well. They adore human company and are compassionate and intuitive, also used as therapy dogs often. Devoted and full of personality, not shy and neither fierce, they make a good guard dogs because of their distinguishable loud barking. They have a double coat having hair all over the body because of which it needs daily brushing. Keeshonds are clean breeds which groom themselves; however, bathing should be done when needed with dry shampoo. The Keeshond can provide a challenge while training as they have a devilish streak and love to make their own routine. They follow constant, just and firm training but may become easily bored with repetition. This breed of dogs is happiest when they are enjoying the family activities and since they don’t need a lot of exercise, they are apt for apartment living. They however, immensely enjoy daily walks, playing balls and with Frisbees. If left alone outside for a longer periods of time then they may become bored and begin digging.